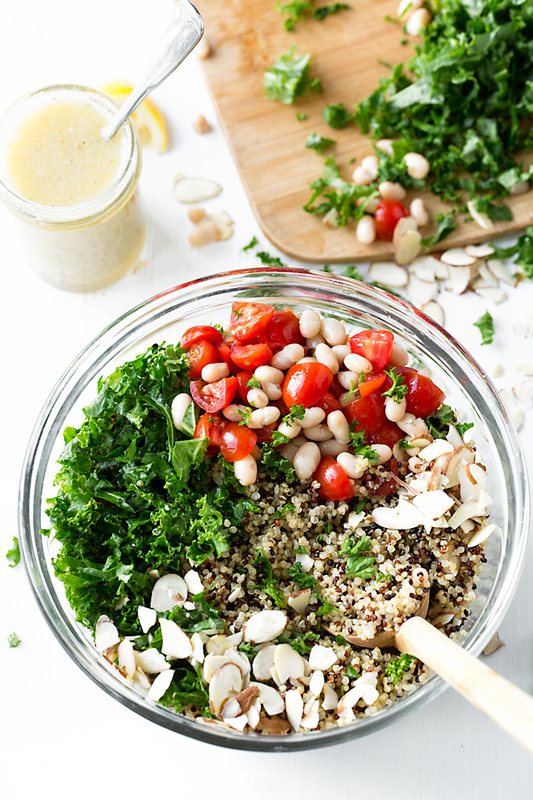 If you enjoy quinoa as much as I do, and are looking for fresh, new ways to prepare it, then this bright and hearty quinoa salad with kale, white beans, and a few other tasty add-ins is definitely one to add to your repertoire! My, oh my… when I think back over the years, I can tell you that I’ve definitely made my share of quinoa dishes! 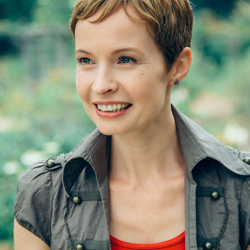 During my personal chef days, I cooked for folks who were gluten-free and very health conscious. I would use quinoa (a seed that comes from the amaranth plant—loaded with protein, fiber, and all nine essential amino acids), in a variety delicious ways. I prepared quinoa as either a warm side dish in place of traditional pasta, or as a change of pace from rice or potatoes. I also added quinoa to my lemony chicken and spring veggie soup, or substituted it for the rice in the filling of my roasted acorn squash. But when I was looking to make something a bit more cool and refreshing, and easy to stow away in the fridge for a couple of days, I would prepare a quinoa salad recipe loaded up with all sorts of hearty and healthy tidbits, all tossed together with a flavorful dressing. A bowl of quinoa salad is so scrumptious, and has the wonderful bonus of being so good for you too! While I don’t necessarily have a favorite type of quinoa when it comes to preparing my quinoa salads (I like them all), I do more often tend to choose the tricolored quinoa because it uses a color blend of red, brown, and white quinoa, which offers a nice texture and a little added kick of pretty color. And to give a little complexity and extra protein, fiber, and crunch to my quinoa salad, I love to add in nuts such as almonds, walnuts, or pistachios, and beans such as white beans, garbanzo beans or black beans. An addition of halved or quartered juicy cherry tomatoes along with some finely julienned kale provide some freshness, color, and extra nutrients. All that’s left to finish off my quinoa salad with is a little flourish of fresh herbs and a drizzle of a good dressing, such as a tangy lemon vinaigrette-style dressing. This is a definitely a salad that is not only cool, colorful, and flavorful, but filled with good-for-you ingredients—a genuine pleasure to savor. Choose your quinoa: Because it’s a little more colorful and eye-catching, I tend to favor the tricolored quinoa; but you can certainly use the white or red quinoa as well—whichever you prefer! How to cook your quinoa: I’ve found that many of the instructions on the packages of quinoa tend to not give the best cooking method, and the quinoa gets a little soggy, or isn’t quite right. My personal general ratio is 1 cup quinoa to 1 1/4 cups water (or broth, as in this case). I combine the water or broth with the quinoa, bring it to the boil, then cover and reduce the heat to a low, gentle simmer; once the water is gone (about 20 minutes), I remove the lid and allow the quinoa to rest for 5 minutes, then fluff it with a fork and proceed with the recipe. 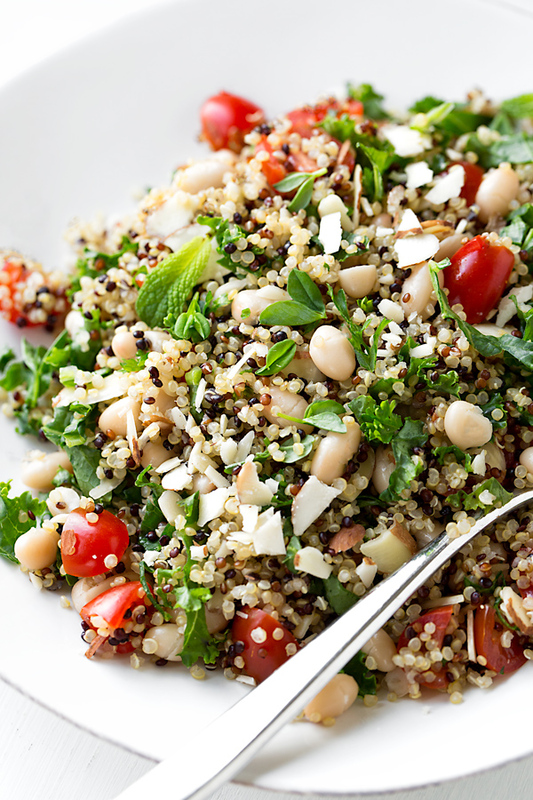 Cool your quinoa for salad: Before adding in your other salad ingredients, take some time to cool your quinoa. I like to line a large baking sheet with parchment paper, and then scoop the cooked quinoa out onto it, spread it out, and allow it to cool to at least room temp. Tweak your add-ins: I love the flavor and health benefits of almonds, but you can also use pistachios, walnuts, cashews, or your favorite nut. You can also substitute the white beans for garbanzo beans, black beans, or any other bean. 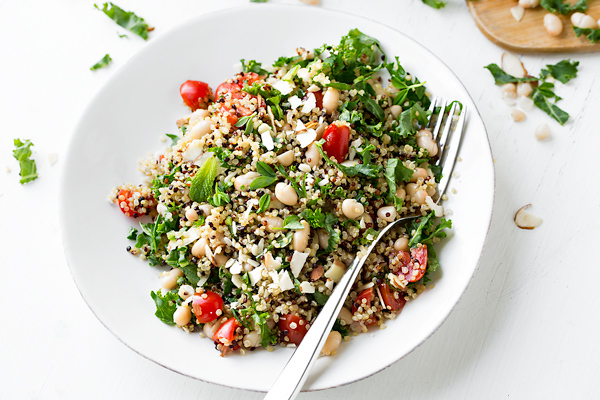 This quinoa salad with the delicious option of a zippy lemon dressing is sprinkled with white beans, sliced almonds, fresh cherry tomatoes and kale—it’s a delicious and nutritious meal on its own, or scrumptious served as a healthy side dish! –In a medium pan or pot set over medium heat, combine the quinoa with the water or broth (if using water, add a couple of pinches of salt); bring to the boil, then reduce the heat to low and cover, and allow to very gently simmer for about 20 minutes, or until the quinoa has absorbed the water and is tender; remove from heat, uncover, and allow the quinoa to sit for 5 minutes before fluffing with fork; then, allow it to cool. –Prepare the dressing by combining all of the dressing ingredients in a small bowl and whisking until completely emulsified, and set aside. You can also add the ingredients to a mason jar and vigorously shake. 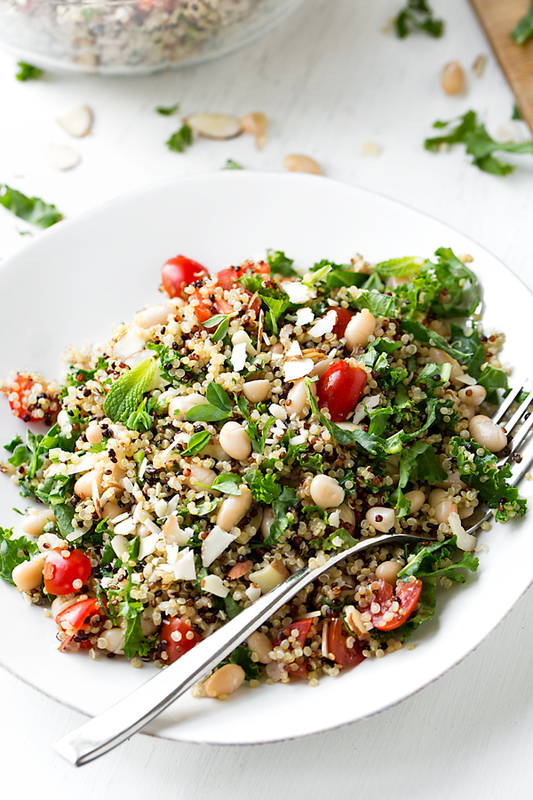 –Once the quinoa is cooled, add it to a large bowl along with the cherry tomatoes, the white beans, the sliced almonds, the kale and all of the fresh herbs, and lightly toss to combine; then, drizzle as much of the dressing in to suit your taste and toss together, then check/adjust the salt and pepper, if necessary. –Serve immediately, or keep cold and covered in the fridge. Ok, I admit it. I’ve never tasted quinoa.. Maybe I should! This looks absolutely delightful! 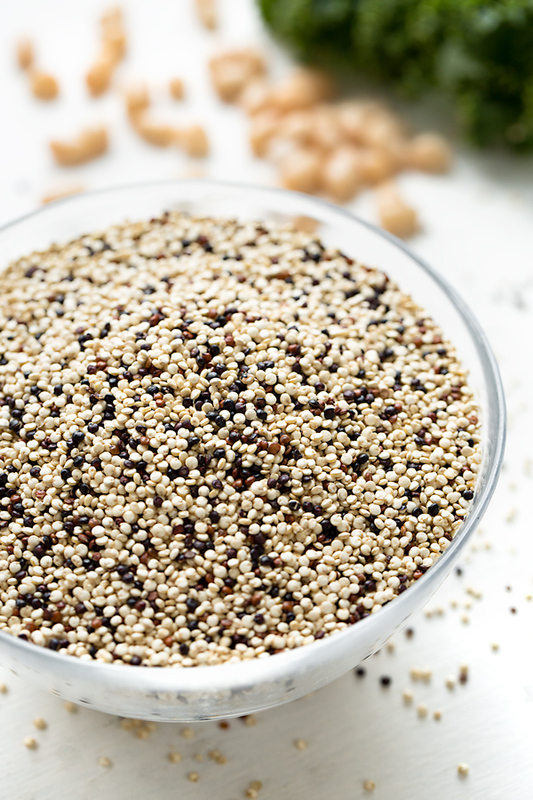 I’m a big quinoa fan and I’m always impressed with how versatile this little superfood can be. This looks absolutely fantastic! I love quinoa and your dressing looks amazing! Sounds delicious. I’ve only tried quinoa once and I didn’t like it all that much that I’m willing to give it another shot. Any idea if multi color quinoa tastes any different from regular ? Hi Vicky, I don’t believe the flavor is any different. I will tell you for sure to try it with the vinaigrette; I agree that quinoa is not the tastiest thing all bare naked, so a good, zingy, garlicky vinaigrette like the one I provide paired with the flavors of the other ingredients may make you a fan, after all. I like the nutrition and simplicity of this recipe – it goes to show you can make delicious and healthy meals without slaving for hours on end. Great recipe! I have been seeing quinoa EVERYWHERE! I have bag of it sitting in my cupboards, but a complete and utter fear of cooking it has taken over. Yes, it’s totally irrational I know. I have to break it out and I’ll start with this! Beautiful! Hi Megan, I think you’ll enjoy this recipe- let me know what you think if you give this a try! This recipe is delicious! I did substitute pecans for walnuts since that’s what I had on hand. Hi Karen, thanks so much for coming back to comment on your experience, and pecans (or whatever one has on hand) are an excellent substitute! Hi Lauren, thanks so much for taking a moment to come by and comment on your experience with the recipe. Quinoa is great served cold, and the addition of shrimp would work very well. Glad you enjoyed it! Love the combination of flavors in this dish. I only recently discovered quinoa but after reading about the various health benefits I’ve been trying to incorporate it more into my weekly meal rotation. This recipe sounds perfect! I just made this amazing recipe and if you could see me right now, you would see me doing the happy dance!! My husband also loved it. What is better than really healthy food that is easy to prepare and tastes delicious??! 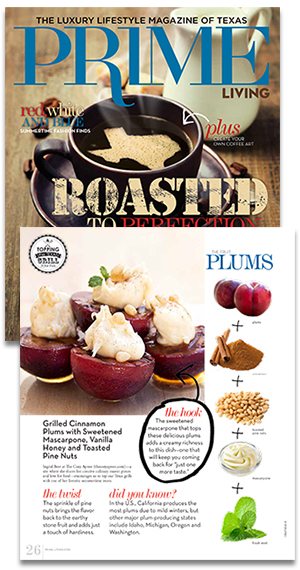 Thanks for sharing this recipe, and I will be surfing your site for more ideas. Melinda, that’s pretty funny. So glad you gave this a try and enjoyed it – my goal is to make healthy food taste delicious and be accessible for everyone, so that we ALL can do the “happy dance” when we eat!